We’re still coming down from an awesome week at re:Invent! 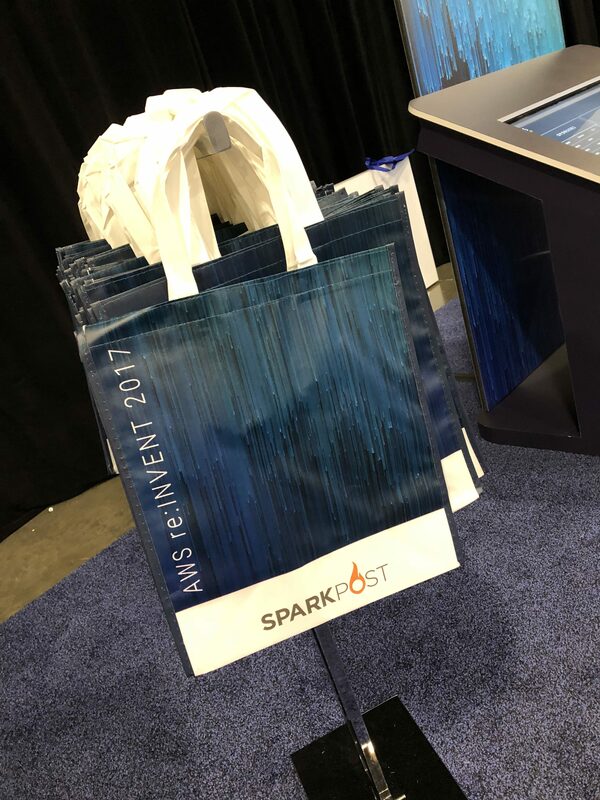 Between the technical sessions, partner talks and our #FindTheFlame campaign at the SparkPost booth, there was no shortage of excitement. We thought it’d be fun to do a quick recap of our top re:Invent takeaways. Here’s the scoop from our team members sitting in on conference sessions and those that manned our booth in the expo hall. Enjoy! Our team is pumped about several new networking features including Cross-Region Peering Connections, Customer PrivateLink, AWS Shield Advanced and AWS Guard Duty to name a few. Cross-Region Peering Connections will extend the peering connection functionality to work between VPCs in different regions and will dramatically decrease the complexity needed to securely connect shared service tiers. PrivateLink has been extended to allow users to attach their own services to it – something our engineers are also excited to experiment with. AWS Shield Advanced will provide managed DDoS protection, and AWS Guard Duty is an ML-based threat detection service we’re also looking to explore more. AWS also announced some new services at re:Invent, first up AWS Fargate, which allows the deployment and management of containers without any of the underlying infrastructure. We’re also excited for ECS for Kubernetes, which is functionality to run Kubernetes on AWS without needing to be an expert in Kubernetes. Additionally, AWS Lambda Function improvements are coming, including being able to shift traffic from one lambda to another. AWS announced the next generation of c5 instances, and how they’re faster and cheaper than previous generations. In addition, EC2 T2 Unlimited is a highly burstable instance type that will scale efficiently with workload. Also, Bare metal instances will support new use cases and workload types that can benefit from this though we are still evaluating if they are right for us. Give yourself plenty of time to get from Point A to B. The shuttles were sometimes slow and while the hotels on the Vegas strip are well connected, it definitely takes time to get from place to place. Many of our team members opted to commit to one venue each day. If that’s not possible, just plan for 30-40 minute walk times between venues (taxi lines were also quite long). Check for new sessions each morning. Many new sessions were added to the agenda last minute, so next year, be sure to check often for updates. Be prepared for swag. With over 350 companies exhibiting at re:Invent, there was no shortage of swag. Between drones, droids, t-shirts, socks, koozies & other tech gadgets, be prepared with something to collect all the awesome giveaways. Even with a reservation to sessions, be prepared for a wait. Some team members were more successful than others at booking sessions in advance. However, it was possible to get into many of the walk up sessions. Some sessions had lots of extra seats but lines were very long for 300 and 400 level talks and for anything just announced, which meant getting in line an hour in advance. Our marketing team had an awesome time putting together our #FindTheFlame campaign this year. In case you missed it, we commissioned a 6 foot tall flame sculpture built entirely out of LEGOs and ran a selfie contest on Twitter using the #FindTheFlame hashtag. The campaign took off and we even won an award from AWS for Best Integrated Marketing Campaign. You can check out our entire album of #FindTheFlame selfies here. We hope to see you at next year’s re:Invent! ps: AWS has uploaded the re:Invent talks to YouTube, so catch up if you weren’t able to attend! Learn why we built a 6 foot tall lego flame for AWS reinvent and how we turned #FindTheFlame into an award winning Integrated Marketing Campaign. How building our service on top of Amazon Web Services (AWS) instead of a data center has given us the agility needed to sustain rapid growth. Learn some successful strategies we use to build our microservices architecture and how they allow us to evolve our API during rapid growth.